[i] First published in Gutman's book on the weekly Torah portions; "From the Old City"
We are told to drink so much on Purim that we cannot tell the difference between "Bless Mordechai and curse Haman," or the other way around! What does this mean? How is it possible to drink like that? First, for a well-known fact: if you mix drinks – whiskey, wine and vodka or whatever - the chances are that you are going to become violently ill and miss the entire point of the party. (You will also earn the great disrespect, to put it mildly, of the one who has to clean up after you.) 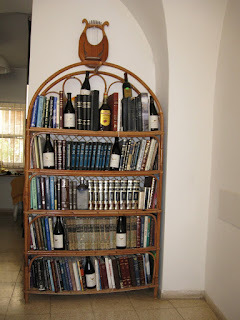 It is best to drink wine since wine was served at the original Purim party. [ii] Whatever taste you prefer is fine, but know that sweet wine usually makes you sick, and stick to one type throughout the entire day. The spiritual task on Purim is not simply to be happy. We must try to experience the highest spiritual joy possible. This joy comes when Hashem's Presence is unmasked. How can drinking on Purim do this? By breaking down the human system of logic that prevents this understanding from dawning. We try to take a peek into the greatest mystery of all. This can happen only when there is joy, and this joy has to be the joy that comes from doing a mitzvah. We are not searching for mere physical joy, such as the joy that comes from eating and drinking. But on Purim, even the joy that comes from eating and drinking is a mitzvah! Once, there was a holy King. This King was not just an ordinary king. This King demonstrated his royalty by exuding a wondrous feeling of bliss. This feeling was so strong and so enjoyable that when his subjects would come into the palace for a feast, they would say, "This feeling emanating from the King is so wonderful, if only there could be more of it." They reasoned that the only thing stopping the King's bliss from entirely filling the room was their own bodies, which took up so much space. They decided to shrink in order to leave more room for the King's bliss. And it worked. As they shrunk, more and more bliss filled the room. They enjoyed the additional bliss so much that they shrunk again and again until finally, they completely disappeared. Unfortunately, this left the King with a problem. "I want to enjoy a feast with my subjects, but every time I invite them over," he complained, "they disappear on me. I want to eat and drink with my friends, but they evaporate right before my eyes. I don't want to eat and drink all this food by myself." "Wait a minute, I know what I can do," he reasoned. "After all, I am the King, so I can do whatever I want. I'm going to apportion myself around the banquet table. I am going to take small portions of myself and form these individual portions into different people, and on each person I am going to put a distinct mask. Each portion is going to see itself solely as the person that its mask depicts. And this mask is going to be stuck on each portion so that none of them will be able to remove its mask for the entire party. Maybe some portions will be able to sneak a peek from time to time, but for the most part, the masks are going to be permanently affixed." "What a party it will be! There will be eating and drinking and grand entertainment, with everyone ordering whatever he wants and eating whatever he orders. Then, at the appropriate time, when the feast is over, the strings holding on the masks will be loosened and each portion will be able to lift off its mask and see it was really only me sitting there the entire time." This is the hidden story of Purim. This is why we wear masks and costumes on Purim, hiding our true identity. The truth is, only the King will be at your Purim meal, but you will not know this because logic tells you that you and your friends are the only ones there. And this is why we drink so much on Purim. When the wine goes in, the mysteries come out. This year, when you are so very drunk, try to recall who is really filling your body. Try to take a peek under your mask.